ah HA! I finally got it! Thank you, LT, for the birthday gift of it! I enjoyed it thoroughly. Truss bemoans the fact that manners have pretty much gone out the window. The reason, although she stated it in slightly different terms, is that we've forgotten to "treat others as we would like to be treated." We live as individuals who are never wrong and if our behavior is ever remotely questioned, we act as if we've been brutally attacked. There is no room in today's society for condemnation and/or correction of bad behavior. Truss argues that there is still, btw, a difference between "good" and "bad" and suggests that we might want to go back to using those two terms to define behavior. She has a point. Today's society is very individualistic. The power of One. An Army of One (HELLO!?!?! Does anyone else ever feel frightened by the idea of an Army of One. Think about it.) Be Yourself. Be True To Yourself. Believe in You. Ect. Etc. We act as if we live all alone on the planet. This does tend to wear out manners. Everyone else is in the wrong and I am the only person in the right. We take this attitude with us wherever we go: restaurants, the road, our homes and yes, even our churches. The person in the pew next to you is no more important than yourself and certainly never more so. It is always about you. It is always about me. But the two do not coincide, usually. What would happen if we started placing other people's feelings about those of our own? Truss would argue that there would be a revolution in the world of manners and we might all enjoy living on this planet a bit more than we currently do. Of course, when anyone is talking about manners, they usually have a few pet peeves. Truss has her own which she relates. I have mine, which I will relate whenever I feel like it. Pet peeve central here I come! But what's the point, really? What it boils down to is that we learn to treat others with respect and a kindness that they do not deserve. Remember this: You don't deserve such kindnesses either. So stop your fussing. Now, of course, whenever I start thinking about any topic, it seems to present itself for my consideration in a myriad of ways. 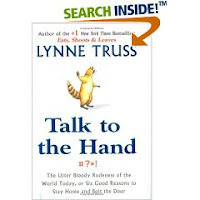 For example, I just finished this book on manners so I'm fixated on the subject, right? Last night my husband and I went out to dinner on our date night. We walked into a rather high class restaurant here in town. The sign said "please wait to be seated." No one else was in the foyer. And I do mean no one. Including the person who should have been there to seat us. We waited for 5, 7 and then close to 10 minutes. Finally the restaurant phone rang. My husband asked me how much I would want to bet that the hostess would come to the front and answer the phone before she helped us. Not only did the hostess answer the phone but she barely took a split second to tell us that she'd be with us in a second before she took the phone with her to the back again! Furthermore, it was not a customer on the phone; it was someone that she knew and was carrying on a conversation with! I could not and still cannot believe it! Needless to say, we didn't stay to wait around any longer to be sat or to eat. I've never been treated like that EVER at a restaurant before. This, coincidentally, is a pet peeve of Truss (and Mirlandra) in that when you are a patron of an establishment, the employees (in this case, a hostess) should treat you with respect because you've selectively chosen to do business with them. It's called Customer Service. Even that is a lost art these days. This book is an entertaining way to agree with someone that the public at large is bad off where manners are concerned. I think everyone can find something to identify with in this book. I'll warn you that her use of language is, well, British, but if you can overlook that you are well on your way to a rousing good time. I've wanted to read that book, it sounds like I would enjoy it. Manners count for alot! When Mike was on cruise I was a very distraught, high strung person. Just someone smiling and say hi to me would make my day but I can't even count how many people were hurtful and mean, not just rude. As Christians we should find manners a highly appropriate avenue of showing Love the way Jesus would want us to. Carrie, great review; makes me want to read it! I too bemoan the state of manners these days, but I hope if anything it reminds me to be as courteous as possible myself. As an introvert I prefer to ignore people because I find it challenging to deal with strangers, but living in the city is good for my sanctification: you're practically living on top of tons and tons of other people. It reminds me constantly that being a Christian is God redeeming relationships through us. It repeats in my mind constantly "who is my neighbor?" and somehow, slowly, awakening in me God's love for others. And I would have wanted to strangle that hostess. One of my all-time favorite books. Thanks for the review. Whenever I need a laugh, I definitely think of her first. But she also makes important points, and I love that she manages to do it whiler retaining an element of balance. I love this book. I thought I would drive my husband crazy because I kept laughing and nodding my head in agreement while reading!